As summer really got underway, I got a new dog and fell woefully behind in blogging. While dog walks are great for moving through audiobooks, having a playful pup at your feet is not so good for finishing books in print! Apologies all around. Pre-pup, I read Candice Millard's "Destiny of the Republic" on the recommendation of a colleague who knew I had enjoyed "River of Doubt." If I liked "River of Doubt," I was completely blown away by "Destiny of the Republic." I knew very little about President James A. Garfield prior to reading this book, and now I regret that oversight. President Garfield was the 20th President of the US, and the second president to be assassinated. Unfortunately, that's the fact for which he was best known. He became a presidential nominee at a nominating convention he attended in order to stump for another candidate, was modest and down-to-earth, and firmly believed in the need for civil rights reform. He cared deeply for his family, and had he lived longer, he could have been an incredible president. Millard tells the story of Garfield's short presidency, beginning with his nomination and campaign, and running through and after his assassination. Interwoven with Garfield's story are the two men who played a large role in his death - his shooter and the doctor whose negligent treatment failed to save his life. Characteristic of Millard's work, this non-fiction book reads like a novel. I learned a ton, and had a great time. The audio narration was also superb. Verdict: Affirmed - highly recommended for history fans, thriller fans, or anyone who just likes a good read. I can't wait for Millard's next book. 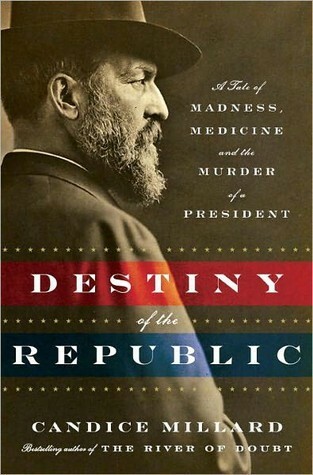 "Destiny of the Republic: A Tale of Madness, Medicine, and the Murder of a President" by Candice Millard, published September 20, 2011 by Doubleday. Audio narration by Paul Michael, published September 20, 2011 by Random House Audio.